Three Hundred and Sixty-Five Days! Whatever your position on the policies of the government of Israel, I think we all can agree that it was an honor to have the leader of the State of Israel address the Union for Reform Judaism's recent Biennial. And it is a pleasure to be able to share it here on the Adas Emuno congregational blog. The off-camera voice introducing and interacting with Prime Minister Benjamin Netanyahu in this video belongs to URJ President Rick Jacobs (see our previous post, Surf's Up for the Future of Reform Judaism). The video Israeli Prime Minister Benjamin Netanyahu - 2013 URJ Biennial was posted on YouTube on December 16th. For more on the 2013 Biennial, go to http://urj.org/biennial. "The state of affairs, which indeed is equaled nowhere else in the world, can properly be called mass culture; its promoters are neither the masses nor their entertainers, but are those who try to entertain the masses with what once was an authentic object of culture, or to persuade them that Hamlet can be as entertaining as My Fair Lady, and educational as well. The danger of mass education is precisely that it may become very entertaining indeed; there are many great authors of the past who have survived centuries of oblivion and neglect, but it is still an open question whether they will be able to survive an entertaining version of what they have to say. " -Hannah Arendt, "Mass Culture and Mass Media"
If we substitute the word "religion" for Hamlet, and the phrase "great religious traditions" for "great authors of the past," this question may stand as the decisive critique of televised religion. There is no doubt, in other words, that religion can be made entertaining. The question is, by doing so, do we destroy it as an "authentic object of culture"? And does the popularity of a religion that employs the full resources of vaudeville drive more traditional religious conceptions into manic and trivial displays? In returning to Postman's critique of the age of television, I decided to use this same quote in my own book, noting how Postman had used it earlier, but this time placing it in a chapter on education. In particular, I brought it up following a brief discussion of the latest fad in higher education, massive open online courses, abbreviated as MOOCs. A MOOC can contain as many as 100,000 students, which raises the question of, in what sense is a MOOC a course, and in what sense is the instructor actually teaching? It is perhaps revealing that the acronym MOOC is a new variation on other terms associated with new media, such as MMO, which stands for massive multiplayer online (used to describe certain types of games), and the more specific MMORPG, which stands for massive multiplayer online role-playing game. These terms are in turn derived from older ones such as MUD, multi-user dungeon, and MUSH, multi-user shared hallucination, and also MOO, multi-user dungeon, object oriented. In other words, the primary connotation is with gaming, not education. Holding this genealogy aside, it is clear that offering MOOCs is presently seen as a means to lend prestige to universities, and they may well be a means to bring education to masses of people who could not otherwise afford a college course, and also to individuals who are not interested in pursuing traditional forms of education, but then again, there is nothing new about the phenomenon of the autodidact, which was made possible by the spread of literacy and easy availability of books. There is no question that much can be learned from reading books, or listening to lectures via iTunes, or watching presentations on YouTube, but is that what we mean by education? By teaching? Regarding Arendt's comments on the dangers of mass education, we might look to the preferences of the most affluent members of our society? What do people with the means to afford any type of education available tend to choose for their children, and for themselves? The answer, of course, is traditional classrooms with very favorable teacher-student ratios, if not private, one-on-one tutoring (the same is true for children with special needs, such as autism). There should be no question as to what constitutes the best form of education, and it may be that we do not have the resources to provide it, but still we can ask whether money should be spent on equipping classrooms with the latest in educational technology, when the same limited resources could be used to hire more teachers? It is a question of judgment, of the ability to decide on priorities based on objective assessment, rather than automatically jumping on the new technology bandwagon time and time again. The broader question that concerns both Arendt and Postman is whether serious discourse, be it educational, religious, or political, can survive the imperative to make everything as entertaining as possible. For Arendt, this was a feature of mass media and their content, mass culture. Postman argues that of the mass media, print media retains a measure of seriousness, insofar as the written word is a relatively abstract form of communication, one that provides some degree of objective distance from its subject matter, and that requires relatively coherent forms of organization. Television, on the other hand, is an image-centered medium that places a premium on attracting and keeping audiences, not to mention the fact that of all the mass media, it is the most massive. The bias of the television medium is towards showing, rather than telling, towards displaying exciting visuals, and therefore towards entertaining content. Of course, it's possible to run counter to the medium's bias, in which case you get something like C-SPAN, whose audience is miniscule. The expansion of television via cable and satellite has given us better quality entertainment, via the original series appearing on HBO, Showtime, Starz, and AMC, but the same is not true about the quality of journalism. Cable news on CNN, MSNBC, and FOX does not provide much in the way of in-depth reporting or thoughtful analysis. Rather, what we get is confrontation and conflict, which of course is dramatic, and above all entertaining, but contributes little to the democratic political process. Consider that at the time of the founding of the American republic, the freedom to express opinions via speech and press was associated with the free marketplace of ideas, that is, with the understanding that different views can be subject to relatively objective evaluation, different descriptions can be examined in order to determine which one best matches with reality, different proposals can be analyzed in order to determine which one might be the best course of action. The exchange of opinions was intended to open up discussion, and eventually lead to some form of resolution. Today, as can be seen best on cable news networks, when pundits express opinions, it's to close down dialogue, the priority being to score points, to have the last word if possible, and at minimum to get across a carefully prepared message, rather than to listen to what the other person has to say, and find common ground. And this is reflected in Congress, as our elected representatives are unwilling to talk to each other, work with each other, negotiate settlements, and actually be productive as legislators. Once upon a time, the CBS network news anchor Walter Cronkite was dubbed "the most trusted man in American." And while his version of the news conformed to the biases of the television medium, still he tried to engage in serious journalism as much as he was able to within those constraints. Today, we would be hard put to identify anyone as our most trusted source of information, certainly none of the network news anchors would qualify, but if anyone deserves the title, at least for a large segment of American society, it would be Jon Stewart of The Daily Show. And while there is something to be said for the kind of critique that he and his compatriot Stephen Colbert provide, what they provide us with, after all, are comedy programs, and at best we can say that they do not pretend to be providing anything other than entertainment. But we are left with the question, when so many Americans get their news from late night comedians, does that mean that journalism has become a joke? Cable television has also given us specialized educational programming via the National Geographic Channel, the History Channel, and the Discovery Channel, and while this has provided an avenue for the dissemination of documentaries, audiences are especially drawn to programs such as Dog Whisperer with Cesar Milan, Moonshiners, Ancient Aliens, UFO Files, and The Nostradamus Effect. On the Animal Planet channel, two specials entitled Mermaids: The Body Found and Mermaids: The New Evidence, broadcast in 2012 and 2013 respectively, gave the cable outlet its highest ratings in its seventeen-year history. These fake documentaries were assumed to be real by many viewers, prompting the National Oceanic and Atmospheric Administration to issue a statement stating that mermaids do not actually exist. And it is almost to easy to mention that The Learning Channel, aka TLC, has achieved its highest ratings by turning to reality programs, such as Toddlers & Tiaras, and its notorious spin-off, Here Comes Honey Boo Boo. An object is cultural to the extent that it can endure; this durability is the very opposite of its functionality, which is the quality which makes it disappear again from the phenomenal world by being used and used up. The "thingness" of an object appears in its shape and appearance, the proper criterion of which is beauty. If we wanted to judge an object by its use value alone, and not also by its appearance… we would first have to pluck out our eyes. Thus, the functionalization of the world which occurs in both society and mass society deprives the world of culture as well as beauty. Culture can be safe only with those who love the world for its own sake, who know that without the beauty of man-made, worldly things which we call works of art, without the radiant glory in which potential imperishability is made manifest to the world and in the world, all human life would be futile and no greatness could endure. Our constant stream of technological innovation continues to contribute to the functionalization of the world, and the dominance of what Jacques Ellul called "la technique," the drive toward efficiency as the only value that can be effectively invoked in the kind of society that Postman termed a technopoly, a society in which culture is completed dominated by this technological imperative. 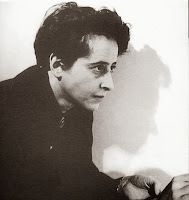 The futility of human life that Arendt warns us about is masked by our never-ending parade of distractions and amusements; the substitution of the trivial for greatness is disguised by the quality and quantity of our entertainment. We experience the extremes of the hyperrational and the hyperreal, both of which focus our attention on the ephemeral, rather than the eternal that Arendt upholds. She argues for the importance of loving the world for its own sake, which requires us to be truly ecological in our orientation, balanced in our approach, clear and true in our minds and our hearts. Is there any question that this is what is desperately needed today? Is there any question that this is what seems to elude us time and time again, as all of our innovations carry us further and further away from the human lifeworld? The Barry Sisters, Clara and Minnie Bagelman, first known as the Bagelman Sisters, were popular Yiddish jazz singers in the 1940s to 1960. The sisters performed on the New York Radio Show "Yiddish Melodies in Swing," on WHN (Sunday at 1 pm), which would play songs incorporating a fusion of jazz, swing and klezmer in the Yiddish language. a nigendl, a freylekhen mit vertelakh vos gramen. kim der iom tov purim veln mir shpilen zikh in dreidlakh. mit amol heybt on tzupliukhen on gisen a regn. zainen ale khasidim trinken arois...nor....Der rebe iz arois a naser. A little melody, a happy one, with words that rhyme. Chiribim, Chiribom . . .
All of a sudden it started to storm and the rain poured down. All the Chassidim came out dry, but the Rabbi is drenched. And with that, we say, Shabbat Shalom! With the completion of the Union for Reform Judaism's Biennial in San Diego this past weekend, we thought we'd share with you the Keynote Address delivered by Rabbi Rick Jacobs, President of the URJ. The address entitled The Genesis of Our Future, was delivered on December 12, 2013. I grew up in Southern California, just a few hours from here, and believe it or not, I spent a chunk of my early teens surfing waves on the beaches of Orange County. A flat, calm Pacific Ocean spelled disappointment, even boredom. But most weeks, there were at least a few swells. And every so often you would hear cries around our high school: "Surf's up." Which meant: put everything on hold, grab your board, and hustle to the beach. Once or twice the swells were just awesome, beyond belief, the kind that would scare even Judah Maccabee to death. Why am I telling you all of this? Am I suggesting that you skip tomorrow's sessions, buy a wet suit, and hit the surf? Not really. I'm telling you this because surf conditions can be helpful in describing the level of challenge facing our Jewish community today. In the 1950s, the waves of Jewish life were steady and easily ridden. Our Reform Movement grew with ease, as congregations harnessed the baby-boomer migration to suburbs throughout North America. Since 1990 or so, those waves have grown larger, as concern for Jewish continuity sent shock waves through every Jewish communal institution, especially synagogues. More recently, the waves have grown larger still, at times threatening to capsize us. For the first time in Jewish history, people of many faiths are happy to befriend us, work with us, and, yes, marry us. At the same time, radical individualism threatens our collective identity, while technology decentralizes authority and transforms how we learn and connect. Big waves require more skill and courage to ride - but if ridden artfully, they enable us to go faster and further than ever before. Friends, "surf's up." It's time to grab our boards (surf boards, temple boards, whatever works!) and ride. Two years ago at our Washington, D.C. Biennial, I wasn't yet the URJ president and I was only unofficially riding those big waves. And still, I promised that miketz sh'nataim, "at the end of two years" - we'd be busy re-imagining Jewish life. And that's exactly what we have done -- and are doing. Tonight, I want to tell you where we are, and where we're headed. This week, we finish our reading of the first book of the Torah, so I'd like to use the Book of Genesis as a prism through which we can glimpse not only our past, but more importantly, our future. Bereisheit bara Elohim, in the beginning, God didn't create synagogues or rabbis or denominations or even Jewish people. No, God created a wondrous universe, teeming with beauty, complexity, and possibility. Within this incomplete world, God created human beings to be partners in shaping a world overflowing with shleimut (wholeness), rachamim (compassion), simcha (joy), and tzedek (justice). But, God discovered that finding the right partners in this holy work was easier said than done. Cain was selfish and violent. The people of Babel were reckless, with delusions of grandeur. And Noah was content as long as his own family was safe, but he didn't have the spiritual reach to include strangers in his circle of responsibility. Abraham and Sarah are called upon to set out on a radical new journey, to a new land and a covenantal relationship with the Holy One - a journey that leads them to deserve the promise God made to them, that, v'nitbarchu v'cha mishpachot ha'adama, "through you, all of the families of the earth will be blessed." We know that we cannot do our work without others, without partners. Throughout our history, we Jews have created a variety of institutions to sustain our devotion to God's intended path for us. And institutions have their own logic, their own dynamic. Sometimes we forget that they are means, not ends. We are called to do something bigger and grander than simply being caretakers of Jewish institutions. What is that something? Our Jewish job is to build a more vibrant, richer Jewish life for our people and communities, so that we can live up to our partnership with the Holy One in creating a world of wholeness, compassion, joy and justice. As long as a structure or institution of Jewish life serves the sacred mission of our people, it deserves to be preserved. But now and then, and especially now, we are well-advised to examine the fit between ends and means, in order to ensure that we remain devoted to the audacious imperatives that got us started. I say "audacious," from the word "audacity," which the dictionary equates with boldness, fearlessness, and courage. The Jewish people is here today because those who came before us were audacious, courageous, fearless, and bold. Genesis teaches us the power of practicing audacious hospitality. Early in Genesis, Abraham and Sarah set the standard. On a blisteringly hot day, Abraham runs after three desert wanderers, insisting they come inside for nourishment. What makes his act so memorable is that he doesn't wait for the wanderers to knock on his door; instead, he goes out to meet them where they are and invites them in. A couple of months ago, I arrived early at one of our URJ congregations to speak on a Friday night. After trying to figure out where the entrance was, I found the lobby, where a woman wearing a nametag looked at me and barked: "What do you want?" I answered: "I want to be in a congregation filled with warmth and welcome." She eyed me with a look of, "Boy, do you have the wrong place!" Then she looked over her shoulder at the easel in the entryway, which had a picture of a guy who looked a lot like me. She pointed at the picture and asked, "Are you him?" I nodded yes. With suddenly discovered warmth, she said, "Well, why didn't you say so?" That's not audacious hospitality. To be sure, many of our congregations do an outstanding job of welcoming, but many do not; and even if yours does, are you sure that everyone in a position to represent you is among those who do? So here's a simple thing you can do when you get home. Take every member of your board, every staff and team member, everyone who might come early one Friday night, and give them a run-through on the power of being Abraham and Sarah. But being welcomed at the door, even by greeters with nametags on their clothes, smiles on their faces, and hospitality in their DNA still isn't enough. Audacious hospitality isn't just a temporary act of kindness so that people don't feel left out; it's an ongoing invitation to be part of a community where we can become all that God wants us to be - and a way to transform ourselves in the process. Audacious hospitality is a two-way street, where synagogue and stranger need each other. Hospitality is not just our chance to teach newcomers but, just as important, an opportunity for them to teach us. And worse even than the smugness of self-satisfaction, is the charge heard from some within the organized Jewish community proclaiming that these outsiders just don't know and don't care about Jewish life. Why bring them in if they will only dilute our commitment? And who is to say whose commitment will turn out to be greater in the end? This past year, I spent a Shabbat at Shir Tikvah Congregation in Minneapolis, where, for the past 25 years, the synagogue has practiced what members call "radical hospitality" - inspiring spiritually homeless souls to feel the loving embrace of real community. Warmth, acceptance, and openness flow from every communication and every human encounter. In a Jewish world where many more Jews are outside than inside, how can we not practice audacious hospitality? When women finally became rabbis, cantors, and board presidents, they didn't just fill the previously conceived roles; they critiqued and reshaped Jewish life. We need to do the same now with the LGBTQ community, with multi-racial Jews, with intermarried families, and with Gen X and the millennials, all of whom have much to teach us. Let's be frank. Even when they get inside our doors, many of these folks are convinced of not much more than the fact that we can smile. Are they equally certain that we want them? That's the question. The answer is an emphatic yes. Only by being inclusive can we be strong; only by being open can we be whole. The paradigm for the audacity I am discussing came when, decades ago, Rabbi Alexander Schindler overturned all previous Jewish communal assumptions about interfaith families by insisting that instead of closing our doors, we should warmly embrace these families and draw them close in all aspects of Jewish life. How congregations do this holy work varies, but today, it is an axiom of Reform Judaism that we do this work of inclusion every day. And what a difference it has made: bringing the creativity, leadership, and service of hundreds of thousands of interfaith families to enrich our congregational lives, while countless thousands of children are being raised with meaningful Jewish experiences and commitments. Incredibly enough, however, I still hear Jewish leaders talk about intermarriage as if it were a disease. It is not. It is a result of the open society that no one here wants to close. The sociology is clear enough; anti-Semitism is down; Jews feel welcome; we mix easily with others; Jewish North Americans (researchers say) are more admired overall than any other religious group. So of course you get high intermarriage rates - the norm, incidentally, in the third or fourth generation of other ethnic groups as well. In any event, we practice outreach because it is good for the Jewish people. Interfaith couples can raise phenomenally committed Jewish families, especially when they do it in the Jewish community that is offered uniquely by the Reform Movement. The Talmud brags that no person ever greeted Yohanan ben Zakkai first, not even a non-Jew in the market place; it was always ben Zakkai who was first to extend his hand - to Jew and non-Jew alike. Yohanan ben Zakkai is known for completely reimagining Jewish life when the second Temple was being destroyed. The architect of the biggest turnaround in Jewish history knew what it was to be audacious. And so must we. It is not just sociology that demands that we be serious about welcoming interfaith families. It is theology as well. We have a sacred obligation to open our doors, to add to our ranks, and to make sure that progressive Judaism has a growing, not a shrinking, voice in proclaiming what Torah must mean for our time and for our world. It is a veritable gift of God to have the opportunity of a millennium: more non-Jews who want "in" than Jews who want "out." That has never happened before. We dare not squander this gift out of fear of what new voices may say and where new opinions may lead. Congregation Or Ami in Calabasas, CA, identifies itself by saying: "We are also ‘Mosaic' in that we connect back to Moses, a Hebrew child, raised by Egyptians, who married a non-Jewish woman of color and became the leader of his people." And then there are Jews with disabilities, where we pay lip service to inclusion, but too often fail to take real action. Up to 20% of our population is living with some kind of disability at any given time. Some are visible because the person is using a wheelchair or cane or has a service dog. Most are not - think of psychiatric conditions and chronic illnesses that may only be intermittently disabling, but can be especially cruel. Think of people who cannot manage a relationship, hold a job, get ahead, finish school, or even stay out late and have a decent meal on a regular basis. Inclusion is a lot more than changing physical structures and facilities. A ramp is just a sloped sidewalk if stigma and prejudice get in the way. You can subcontract out the construction of a ramp, but being fully accessible and open to people with disabilities is work that we can only do ourselves, person-by-person, moment-by-moment. I think of my Westchester Reform Temple (WRT) student Jacob Wiener who wasn't sure he could become a bar mitzvah. Jacob has autism spectrum disorder and bipolar syndrome. Not only did he lead an inspiring Shabbat service for his bar mitzvah, but in the aftermath he couldn't think of leaving the community that so totally embraced him. Last year, as a 9th grader, he participated in the Religious Action Center's L'Taken weekend in Washington, D.C., where he taught his fellow students and Sen. Kirsten Gillibrand's staff about the importance of supporting the United Nations Convention on the Rights of Persons with Disabilities. This treaty, by the way, will be up for a ratification vote in the Senate as early as next week. I urge you all to contact your senators to ask them to vote for passage of this vital treaty that will change the course of disability inclusion across the globe. We need look only as far as some of our own congregations to see powerful models. At Rodeph Sholom in New York City, a URJ incubator grant helped create inclusive new worship opportunities with room for exuberant and active prayer, without congregants saying "Shhhh!" or "sit down." The congregation's sensitivity and inclusion have brought in families who had given up hope that there was a Jewish community for them. Thanks to a new partnership with the Ruderman Family Foundation, the URJ will be helping all of our congregations remove barriers to participation, so that all individuals can take their rightful place in the center of congregational life. And I'll tell you something else: when we do, when we open our doors - and more, our hearts and minds - and say, "Come in, we need you," we will have new talent and energy beyond our wildest dreams. Al tistakel b'kankan, warned our sages - don't look at the bottle, ela b'mah sheyesh bo, but at what is inside it. Inside those people whom we exclude is another great gift, another opportunity of a lifetime just waiting for us. As we learn from Abraham, "we cannot wait for the seekers to show up at our door, we must go out to meet them where they are and invite them in." Audacious hospitality is a transformational spiritual practice that changes all of us for the better. Genesis teaches us that it never was simple to engage the next generation of Jews. God promised that the first two Jews would grow into a people more numerous than the stars in the heavens, more plentiful than the sands on the seashore. But Abraham and Sarah said, "Not a chance. We can't even have one child, let alone a multitude." Even before the advent of demographic surveys announcing our imminent doom, Abraham and Sarah had reason to worry about continuity. Well, you remember that Isaac and Rebecca become that next generation, fearful in turn that the divine promise will expire with them. Then along came Jacob and Esau. One loved Hebrew school. The other preferred lacrosse. One was dying to get his hands on the birthright; the other couldn't care less. We know these boys; they belong to us. In today's language, Esau was the first "None," a person who doesn't identify as part of the religious community. What astonishes me is that Isaac and Rebecca let him go. They give up on him because his way in the world is not their way. They decide he is not religious. Our teenage Esaus too may love sports, or comedy, or any number of things that seems more attractive than confirmation class; and when they leave home and finish college, joining synagogues may not be the most obvious destination for them. But remember how Esau appeared to Jacob when the two brothers finally met again. "To look into your face," says Jacob, "is to see the face of God." Al tistakel bakankan... "Do not look just at the outer signs of what our Esaus seem to prefer doing." Look deeply into their eyes and see that they, too, radiate the light of God. They may be "Nones" when it comes to organized religion; but they also may be spiritual to the core. Jewish values and community may yet become centerpieces in their lives. This is not to say that we can ignore the facts. Harvard social scientist Robert Putnam has tracked the group called "Nones" since the late 1950s. In 1958, three percent of Americans described themselves as having no religious identification. By 2008, that number had risen to 17 percent. But for Americans in their 20s and 30s today, the number is between 30 and 40 percent. The recent Pew study on American Jewry underscores this trend. I am appalled at how quickly people write-off the "Nones" as hopelessly lost - not even worth the effort of outreach. What a mistake! The same research that documents the "Nones" reveals that many of them believe in God, have some spiritual practice, and attend worship services occasionally, even as they are allergic to institutional religion. It is the institutions as we know them that the "Nones" find distancing. Young "Nones" reject fundamentalist religious trends that breed intolerance, and reject science or mainline expressions that seem stylized, boring, or out of touch. But if that's what being religious means, count me out as well. I'm guessing that most of you would join me. Let's concentrate on our progressive definition of religion, which by all accounts, is not self-evident to the next generation. Let's stop confusing the old and tired institutional patterns of Judaism with the underlying core commitments that really count. At stake is the prophetic voice of Isaiah, the compassionate guarantees of Hosea, the wisdom of Maimonides, the loyalty of Esther - the age-old Jewish voice that insists on justice, cries for the poor, upholds human dignity, demands hope in the face of despair, and finds human purpose even when all seems lost. Are the "Nones" religious? If they care about these eternal verities, then they are. And I am; and you are. Let's not let others define our way of being religious. The next generation wants to know if we share these values, and we are not always clear on that point. They will want to do so in their own way. So let's make a pact among each other, here, today. We will not expect the next generation to be just like us, because only the eternals are not negotiable; everything else is. It can't be so long ago that you've forgotten when you were the outsiders and your parents rolled their eyes at you. My high school rock band told our rabbi we wanted to "wake up" Friday night services. When he reluctantly said OK, out came the black lights, amplifiers, and drums; we wrote new tunes for everything. Many in the congregation hated it; they thought Judaism was on its way down the drain. Guess what? Look at our Movement today: Those experiments morphed into expressions of Judaism that awakened and changed the status quo. One of Israel's most beloved voices, Arik Einstein, was silenced two weeks ago. He woke up the Jewish world by giving us such songs as Ani V'atah N'shaneh et Ha-olam - "I and You Will Change the World." But write the word atah with an ayin, not an aleph - you still get ani v'atah, but with a different meaning: "I and now" can change the world. When is the right time for renewal? Now! We must all be the "I" who take advantage of it. The work of renewal is always, or should be, the job of the next generation that dares to stand up and say "I." Our job is to encourage them to take that responsibility. Each of today's teens, like biblical teens, is unique. Genesis is filled with adolescents trying to find themselves through the painful struggle of spiritual, emotional, physical, and moral growth. So also today: Our youth need communities that are safe, accepting, vibrant, joyful, and grounded in Jewish spiritual values. And our offerings must stretch across the widest spectrum to draw in Rachel and Leah, as well as Joseph and all his brothers. Let me be specific: Currently there are around half a million young Jews between the ages of 13 and18 in North America. Most of them are not actively involved in Jewish life. When we were together in Washington, D.C., two years ago, we squarely faced the staggering statistic that 80 percent of our Movement's young people are out the door by 12th grade. I pledged to you then that our number one priority would be to turn that wide scale disaffection into deep engagement. We are integrating, expanding, and deepening all our youth programs, including our 14 phenomenal overnight camps, NFTY, and our Israel programs into 12-month-a-year, offerings with on-ramps for every teen, including those whose families are not members of a URJ congregation. We are expanding NFTY to include 6th, 7th and 8th graders so we can partner with congregations, providing students with a vital bridge to post-b'nai mitzvah involvement. In six months we'll open our 14th URJ overnight camp, Six Points Science and Technology Camp, which will be located north of Boston. Why should our youth have to choose between science and religion, academics and Jewish values? Our gateways into Jewish life include service learning, leadership, deep learning, social justice, arts, sports, technology, and more, all of which take place over the course of hours, days, weekends, summers, or even longer, here in North America and in Israel. Why? Let me say this as firmly as I can: We're not going to let go of any of our kids. Connecting our camps and congregations more deeply to each other can be transformative, as Rodef Sholom in San Rafael, CA, has demonstrated by redrawing the map of religious education for families and students, and making Camp Newman one of the primary sites for ongoing family learning and living. Across North America, a growing number of our synagogues are forging similar connections with our camps. Deeply and truly engaging our youth is a perfect example of something that even our best congregations cannot do by themselves. The B'nai Mitzvah Revolution, jointly led by the URJ and HUC-JIR, is, therefore, convening our congregations to uncover, identify, and create model bar/bat mitzvah experiences that successfully crescendo into continued involvement and growth. Even when b'nai mitzvah ceremonies are moving and inspiring, if they don't connect our young people to their next step, we can't call them successful. Pediatric Judaism will not engage our youth or their parents. Judaism with depth and relevance will. Har Hashem in Boulder, CO, felt that b'nai mitzvah students spent too much time learning to decode and chant prayers, so they added a new curriculum that emphasizes God-wrestling and text studies that undergird hands-on projects of tikkun olam. The Mitzvoteinu program at Knesset Israel in Elkins Park, PA, requires students to take on social action commitments and then create a presentation - film, writing, speech, or any medium they choose - to illustrate why they believe the activity is part of becoming a Jewish adult. Almost 100 congregations are working together to reboot everything they do with b'nai mitzvah students and families so that bar and bat mitzvah mark the beginning of lifelong Jewish journeys. An essential piece of rebooting this system will be to attract, train, and retain a new generation of well-educated, innovative youth professionals. We must reboot, not just retool, transform, not just tinker. Toward that end, we need massive doses of investment, and I am excited to announce that our vision and programs are attracting them. We owe much to the Jim Joseph Foundation, the Marcus Foundation, the Crown Family Philanthropies, and a growing number of generous individuals who are investing in our vision of a vibrant Jewish future constructed on a scale never before attempted. But we also owe so much to many of you in this room today. Your congregations are our most committed partners, driving the work of the URJ and HUC-JIR in shaping a stronger future, investing funds and creativity into Reform Jewish life, because you share this vision of a bold, audacious tomorrow. And many of you individually offer your financial support to our work through the Fund for Reform Judaism. We are deeply grateful; I am deeply grateful. We simply can't do it without you. So, what does real change look like? To seize an historic opportunity for synergy, we are deepening our partnership with HUC-JIR. So much of our shared future is in forging new leadership. Toward this end, we will be moving many of our New York-based URJ youth professionals downtown to the first floor of HUC's Greenwich Village campus. The visionaries of our new youth strategy are going to interface every day with HUC's students, faculty, and administrators on all three North American campuses. As the college assertively recruits our future rabbis, cantors, educators, and youth and communal professionals, the URJ youth initiatives will create a much wider pool of future leaders. No more silos, no more moving on parallel tracks toward the same goals. The biggest challenges of Jewish life cannot be tackled separately, but must be faced together. The recent Pew study of Jewish Americans offers us a snapshot of reality, a close-up look at many trends - but it does not contain conclusions or remedies. Trends are a wake-up call, not our destiny. In the 1930s, the Reform Movement was shrinking, but in 1937, we repositioned ourselves to be more open to traditional Jewish practices and to no longer oppose Jewish nationalism. In 1951, we moved our headquarters to the center of the North American Jewish population in New York. These shifts changed everything! We adjusted our concept of who we are and what was needed to strengthen Jewish life. That repositioning allowed us to grow dramatically, making us, over the past half-century, the fastest-growing theologically liberal denomination of any religion in North America. And this growth is reflected in the Pew report, which finds that we are not just the largest stream of American Jewry, but larger than all the other streams combined. We must be as open to reinventing ourselves today as in the past. To realign our priorities, just yesterday we closed on the sale of one of our two floors at 633 Third Avenue in NYC, to reinvest our own assets from bricks and mortar to people. So, we're taking a million dollars of our own funds from the sale, to supplement the major foundation grants we have received, to kick-start our dramatic redrawing of the map of youth engagement for the 21st century. Genesis teaches that all human encounters can reveal wisdom and holiness. Throughout the first book of the Torah, God speaks to our ancestors through the people they meet, in the holy moments that unfold at every turn. Abraham is blessed by Melchitzedek, Rebecca is the answer to Eliezer's prayer at the well, and an unidentified man called Ish guides Joseph to his brothers. We, too, must be open to hearing truths from those we meet, remembering that we hold no monopoly on wisdom. That's why I met recently with Rabbi Yehuda Krinsky, a cherished member of the Lubavitcher Rebbe's inner circle, who now has the responsibility of overseeing Chabad's worldwide activities. Shortly after we sat down in his office at 770 Eastern Parkway in Brooklyn, Rabbi Krinsky leaned forward and asked, "Rabbi Jacobs, can we be frank?" I said yes, not sure where he was going. "Why are you so busy trying to get more people into your Reform Movement? After all, you don't care about kashrut, you don't care about Shabbat, and you don't care about mitzvot, so what are you so busy doing?" I responded, "Rabbi Krinsky, we care about kashrut, we care about Shabbat, we care about mitzvot; we just care differently. My job," I told him, "is exactly the same as yours: to try and bring more and more people close to the sacred core of Jewish life." The essential work for the URJ, your congregations, and our Movement going forward is to bring more and more people close to the sacred core of Jewish life. Doing that will require all of us, and I mean all of us, to get clear, aligned, strategic, and busy collaborating so that we can seize this moment in Jewish history - it is a moment that will never come again. The Pew survey tells us something crucial about Orthodox Judaism. In spite of the many Orthodox outreach efforts, including Chabad, to bring less observant Jews into greater observance, the data reveal no real success. Modern and ultra-Orthodox Jews finally now appear to be growing in number because, for the first time in a century, they are retaining their members and growing their ranks with large cohorts of children born and educated within. But otherwise, the trend is decidedly away from Orthodoxy and Conservative Judaism - toward Reform. There are those who would say the trend is from more observance to less, from deep and serious about Judaism to entertaining a passing fancy for it, as if Reform is a watered-down "something else." Butlook around you. Have 5,000 people come to this convention because we believe in doing less, caring less, achieving less, or being less? We came because we want to do more. Our Judaism is for everyone. Our Judaism is inclusive, egalitarian, intellectually rigorous, joyful, passionate, spiritual, pluralistic, constantly evolving and relevant. Soul elevating spiritual practice, life-altering Torah study, courageous practice of tikkun olam, loving care for our community, especially the most vulnerable--that's what we are. Just look at this Biennial if you want to see Judaism that is all of the above and more. I believe with the very fiber of my being that young Jews are hungry, but not for a Judaism frozen in a distant time, no matter how loving and warm the purveyors - including Chabad, in particular - might be. We have what people are looking for, but we've been reticent to get out and say so, partly because we have yet to articulate an audacious vision of what the world can become. God bless Chabad and other outreach organizations for getting out there and sharing their beautiful expressions of Judaism with those who are interested. But theirs must not be the only voices defining Judaism. It's time to speak our minds. Let's be clear about who we are and what we have to say. We believe that our understanding of Judaism is right: that God did not literally hand down sacred laws in the Bible and the Mishnah at Sinai, but rather that from our encounter with the Divine, Jews have written our sacred texts, striving to understand in their own time what God called them to do. That process has continued through the centuries, and it continues today. We are not the way out, but the way in, the way to being fully Jewish and modern, Jewish and inclusive, Jewish and universal, Jewish and compassionate, Jewish and deeply committed also to science, the arts, and the human community in its constant evolutionary spiral toward sustaining the planet and bettering life for everyone who lives upon it. In fact, we have already begun to get the word out. Even five years ago, had you Googled words related to Judaism, you would never have found us. We weren't anywhere near the top of the search results. So one year ago, the URJ created an outward-facing website called ReformJudaism.org, and we are now regularly at the top of the first page of Jewish Google searches. Last month, 116,000 people visited our site. This year, more than half a million individuals who came looking for Jewish substance found it with us. At ReformJudaism.org, seekers are asked if they want to connect to one of their local Reform congregations. The time is long overdue for us to stop using Orthodox Jewish practice as the baseline against which we define our own Jewish practice. We can affirm the authenticity of other Jewish practices without conceding Jewish authenticity to them alone. Our Judaism is appealing to everyone, those from more traditional backgrounds, no Jewish backgrounds, Jews by religion, Jews by culture, and Jews by affinity. We will amply nourish all who are hungry for meaning. Genesis teaches, in our contemporary terminology, that social justice is not a politically partisan concept, but a critical part of what God requires of all of us. At the very beginning of Jewish history, Abraham can't abide injustice. When the rights of others are being trampled, Abraham cannot be silent, even if it means calling the Holy One to task: hoshpeit kol ha'aretz lo ya'aseh mishpat, "Will not the judge of all the earth deal justly?" This statement is arguably the most defining religious imperative of our ancient covenant. What have we done to advance that imperative? This year alone, our Movement has been a leading force for immigration reform nationally, and especially here in California. Reform California - an offshoot of Rabbis Organizing Rabbis, itself a project of the Central Conference of American Rabbis, Just Congregations, and the Religious Action Center - has successfully galvanized congregational leaders from across the state to raise their collective voices for the rights of immigrants. With the powerful leadership of our remarkable Religious Action Center, our Movement also has been at the forefront of the struggle for the freedom to marry, as well as to pass the Employment Non-Discrimination Act, which would ban employment discrimination against those in the LGBT community - and which passed in the Senate last month. And in the wake of the horrific carnage in Newtown, CT, our Movement gathered religious communities together from across the entire religious spectrum to say God is weeping, not only at the death of innocent children and their teachers, but also because of our collective unwillingness to contain the epidemic of gun violence in America. All of these actions make our historic core values real in the world. Our sacred job is to make sure that every society in which we live cares for the poor, the vulnerable, and the forgotten. We can join political debates about how to care for the least among us, but we are forbidden to let politicians alone determine the outcomes. Abraham Joshua Heschel's definition of Jewishness must always be ours: A Jew is a person whose integrity decays when unmoved by the knowledge of a wrong done to other people. The positions that represent the consensus views of those in our synagogues (according to the polls) and the leadership of our Movement (as represented by our official policies passed at our North American conventions and board meetings), have taken a progressive approach to the issues confronting America. But, liberals have no monopoly on authentic Jewish values nor on concern for social justice. And, we must always be respectful of those in our Movement who hold differing political or social justice views. Their voices need to be heard as we shape our positions and - as with every page of the Talmud, which recorded minority as well as majority opinions because eliu v'eilu, these and these were the words of the living God - we, too, must be open to learning from each other. It is no wonder that every poll of American Jews shows that commitment to social justice is one of, if not the most, common expression of Jewish identity among North American Jews - and can be a uniquely effective gateway to reach the unaffiliated and bring them back into Jewish life. No stream of Judaism understands better than we do that a Judaism that does not speak to the great moral issues in the lives of our young people or the great moral issues of the world they will inherit from us will fail to capture the imagination, engagement, and loyalty of the next generation. Genesis describes a Jewish landscape that is devoid of Jewish institutions while ours is cluttered with Jewish institutions vying for relevance. Now let me say this loudly and from the depths of my being: I believe in the centrality of the synagogue. For 2,500 years, Jews have gathered in these remarkably enduring institutions. Even as synagogues have changed constantly, they are built on the core pillars of Jewish commitment. In the first century, synagogues served as courtrooms, schools, and hostels, as well as places for political meetings, social gatherings, and communal meals and worship, as well as for dispensing justice and freeing slaves. Synagogues didn't always have classrooms or school wings or Judaica shops or youth lounges, but they have always been places for the Jewish community to do its most important work as a bet midrash (house of study), bet tefilah (house of prayer) and bet knesset (house of assembly). That said, in the new Jewish landscape, we must be more than a network of congregations. We are the Union for Reform Judaism, linking together a host of the most essential and engaging institutions in Jewish life. Together we can enrich the larger Jewish ecosystem so that we are nurturing and connecting with individuals before they are likely to feel attached and responsible for congregations. Thank God that, with our partners at Taglit Birthright Israel, we are kindling a Jewish spark in so many of these young, unconnected Jews. But we must take that spark and fan it into a flame. For example, we know that young Jewish adults are not likely to join congregations until they are settled - a process that stretches over more years than ever before. Compared to previous generations, young adults wait longer to partner and to have children - if they partner and have children at all. Even with children, they do not automatically join synagogues. The URJ has begun to partner with congregations and focus on connecting families with young children to early childhood programs in congregations, which is about a third of our URJ synagogues. For the rest of our congregations, we have begun to build new bridges to families with young children. Our partnership with PJ Library and the Harold Grinspoon Foundation keeps growing and increases our ability to find those unconnected young families living in our neighborhoods. The time is long past for us to expect these families to find us. A 2010 study by Brandeis University's Mark Rosen outlined the high significance of the first years of a child's life in cementing family patterns and friendships. New parents are at a life stage when they are particularly open to connecting with other Jewish families and the Jewish tradition. This stage provides one of our greatest opportunities to connect Jewish young adults to each other and then to our congregations. This is the time when they are most asking if Judaism will live in their homes, be an anchor in the rhythm of their family's life. Synagogues are a crucial part of the 21st-century Jewish landscape, but they are not islands unto themselves; they are connected to day schools, early childhood centers, day and overnight camps, federations, Hillels, Birthright and the wider webs of engagement and connection. The URJ has a vital role to play in connecting the crucial institutions of Jewish life to strengthen the wider ecosystem from which our congregations will be nourished. Genesis teaches us that no matter where we live, we are bound to the land of Israel. In Genesis, our matriarchs and patriarchs lived part of their lives in the land of Israel and also sojourned outside the land. Were it not for Joseph's inspired public policy leadership in his elevated position in the superpower of the day, the Jewish people and our homeland might not have survived. There has been interdependence between the Diaspora and Israel from the start. In this current moment, the paradigm of Jewish life is moving toward a more globally interdependent world Jewish community that shares responsibility with the State of Israel for the preservation and regeneration of the Jewish people wherever they may live. In Toronto, the new paradigm unfolds with Israeli shinshinim, pre-army teens spending the year working to connect the Leo Baeck Day School, Camp George, and our Reform congregations into a network of Israel engagement. In recognition of that shared obligation, Betty and Arthur Roswell are enabling us to meet the needs of emerging, young, global Jewish leaders who hunger for meaningful experience and learning. Our K'lal Yisrael and Lech Lecha Fellowships will expand our world Jewry and Israel engagement work in unprecedented ways. These intensive programs will nurture and educate young people and, each year, build a cadre of leaders who possess a strong commitment to Reform Judaism, to Jewish peoplehood, and to Israel. We are honored that on Sunday morning, we will hear about and discuss with Prime Minister Netanyahu the serious security threats facing the Jewish State and the critically important peace process. The security concerns that Israel faces are of the utmost concern to all of us. Let us never forget. Israel still remains surrounded by forces that, if they believed they could militarily destroy her, they would not hesitate to do so. Only Israel's strength, enhanced by American support, prevents this outcome. At the same time, we remain deeply committed to the proposition that a real peace process that brings about a viable Palestinian state and secure borders for Israel is indispensible for Israel's security and well-being, even as it is for Palestinian political aspirations and for U.S and Canadian foreign policy interests throughout this volatile, but vital region. We continue to hold that while Israel cannot control what the Palestinians do, it must ensure that through its own policies and actions, it must not act to undercut the prospects for peace. Settlement expansion threatens such goals. I have no doubt that the Prime Minister will address the pressing issue of Iran. We support the efforts of the international community to find a non-military solution to the very real threat of a nuclear Iran. The next few months will be critical. But let us be clear: all options, including the military option, and the certainty of additional sanctions, should the negotiations fail, must remain on the table lest critical sources of pressure on the Iranians to enter and hold to a diplomatic solution be dissipated. In hearing from the Vice President of the United States and the Prime Minister of Israel, we are blessed to know of insights of key leaders charged to respond to this significant challenge. We also will hear from and speak to the Prime Minister about his commitments to make the Western Wall finally a place where every member of the Jewish people can pray according to her or his custom and conscience. I have worked closely with Natan Sharansky and the Israeli cabinet secretary to move this historic opportunity forward. Being a strong, courageous Movement means that we are busy shaping our Jewish world with our audacious commitments. And tonight I can share that with our Conservative Movement and Women of the Wall partners, we are close to agreements with the Israeli government that will physically reshape that holiest of Jewish sites, and for the first time give us roles in overseeing the pluralistic Judaism that will be proudly and publicly practiced there. Our own Anat Hoffman is most responsible for keeping the Jewish world focused on addressing the lack of an egalitarian option at the Kotel, even though the majority of the world's Jews are non-Orthodox. She is a courageous and tireless Reform Jewish leader who has awakened world Jewry to the need to make Israel home for every member of the Jewish people, starting with that venerable retaining wall of the ancient Temple. The Kotel is symbolically important, but our appetite for pluralism and religious freedom extends way beyond those ancient stones. The time is long overdue for equality to reign throughout the State of Israel. Because of our deep love for and commitment to the ideals of the Jewish State, we insist on equality, not just at the Western Wall, but also in rabbinical courts, under the bridal canopy, at funerals, in conversions, and in the founding and funding of our congregations. It cannot be that the great ingathering of the exiles will result in the only democratic state in the world that formally discriminates against the majority of the Jewish people. Orthodox Judaism is, of course, a legitimate choice for those who chose it, but it must no longer be the default position of the Jewish State. That does neither Judaism nor the State a service, quite the contrary. Our Israel Movement for Reform and Progressive Judaism is flourishing. Israelis are discovering that they have a choice, an inspiring choice, when it comes to living Jewish lives of authenticity and relevance. Tomorrow morning, our Movement's new Israel Commission will meet for the first time, bringing together every part of our Reform family that works to strengthen our bonds to the Jewish State and helps to nurture pluralistic, vibrant Judaism - radiating light for all. We are at a tipping point. With the activism and support of this powerful North American Movement, we will yet see transformative change in the practice of Judaism in the Jewish State. We don't speak as supplicants, but rather as partners in this redemptive, revitalizing project of the Jewish people. The bonds that link Israel and the Diaspora are mutually strengthening, and must grow even deeper. We will not stop and we will not be stopped. Genesis reminds us over and over again that we're not home yet. We live in an unredeemed world that we are commanded to repair through small and large deeds of healing. Our sacred job is to bring more and more people close to the very core of Jewish life. In the coming years, I believe we can, and we must, grow and deepen our Movement. If we just grow larger but not deeper, we will be big but shallow, a mile wide and an inch deep. If we grow deeper but not larger, we will matter greatly but only to a smaller and smaller circle, a silo rather that a movement. Are we done? Have we finished reimagining the Jewish future and rebooting the URJ? Of course not; the work is ever ongoing. But we dare not lose sight of all the strengths and blessings of this remarkable Movement of ours. At the end of each section of Torah we say: chazak, chazak, v'nitchazek - be strong, be strong and be strengthened. We are living at a time when the Jewish people is moving from one chapter to the next in the great saga of our people. We look back on what we have achieved since the founding of Reform Judaism and we recognize the enormity of our accomplishments and the multitude of strengths we have brought to Jewish life. With all the enormous challenges we face, this is, paradoxically, a Golden Age of the Jewish people. The Jewish State has been reborn and is a powerful democracy living out the destiny of the Jewish people. And here in North America, more synagogues, more Jewish start-ups, more Jewish camps, more courses of Jewish study, more Jewish PhDs, more Jewish books, more Jewish music, dance, art, and literature are being created, and more people, adults and the young, are visiting Israel than at almost any other period in Jewish history. We have more Jews living in democratic nations that have given us more freedoms, more rights, more opportunities than we have ever known outside the land of Israel. So indeed, I say to you at this beginning of a new chapter of Jewish life: chazak chazak v'nitchazek. Be strong, be strong, and let us all strengthen each other. Look to the future with confidence, for ours is an awesome agenda. There are tremendous waves cresting all around us, my friends, and I, for one, refuse to sit on the shore in fear and trembling. This is our moment. It's time to for us to ride the biggest waves with newfound skill and balance. Let's get busy igniting souls with the fire of our lived Torah and connect them to one another in vibrant communities as we shape a world of compassion, wholeness, joy, and justice. And then, truly, you and I together, we can change the world and through the work of our hands, bring closer the day when we will live out God's promise: - "through you all of the families of the earth will be blessed." May that be the blessing of our gathering, the blessing of the work of our communities, and the blessing of our lives. In Jewish tradition, we call the sermon part of the service the D'Var Torah, which means word of Torah, which is based on the weekly Torah reading. And this week's Torah portion, Parsha Vayechi, is the last one from the Book of Genesis, and the theme that I want to draw from it has to do with the power of words. But first, I want to mention that last Sunday (December 7th), I was a substitute teacher for our religious school's 6th and 7th grade Judaica classes, which was an absolute delight. And the lesson I taught was a special one on the power of words and the ethics of language. This included the basic moral teachings about the importance of honesty in most situations, and the various admonitions in Jewish tradition against gossip. You may recall, for example, the traditional version of our silent prayer, which begins, "May God keep my tongue from evil and my lips from speaking guile." The language is derived from the Psalms. And to underscore the power of words, I pointed out that in Genesis, God begins the creation of the world with words, by saying Let there be light. He speaks Creation into existence, as the text says, "And God said, Let there be light, and there was light." A little later in Genesis, after creating Adam, the Torah says that God had him give names to all of the animals, and it says that whatever Adam called them, that became their name. I should add that I had to explain that what the Torah meant by Adam giving them names was not names like Fred or Sam or Linda, but names like cow, and chicken, and whale. But the point is that giving names to all of the animals was the way in which Adam established dominion over them, and his role as caretaker of God's Creation. The fact that names have power is also reflected in the one name that do not pronounce in the Torah and our prayerbooks, the Yod Hay Vov Hay that is not supposed to be said out loud, which is why we substitute adonai instead. The power of names is also seen in the renaming of Abraham and Sarah, who were originally called Abram and Sarai, their new names symbolizing their new roles as patriarch and matriarch. It can also be seen in the second name given to Jacob after he wrestles with the angel, his new name being Israel. In this, we see a motif common to many traditional cultures, the use of an eponym to personify an entire group of people. It is a way of telling the story, and history, of a people by using a single individual as a symbol to represent the entire nation. In this way, the descendants of the line of Abraham, Isaac, and Jacob become known as the Children of Israel, one people, but they also are represented as a group of tribes. Jacob had twelve sons, symbolizing the twelve tribes of Israel. In order of birth, the twelve sons were Reuben, Simeon, Levi, Judah, Dan, Naphtali, Gad, Asher, Issachar, Zebulun, Joseph, and Benjamin. Each one represented one tribe in the ancient land of Israel, with the exception of Joseph. Instead of a tribe of Joseph, there were two tribes whose names are represented by Joseph's two sons, Manasseh and Ephraim. "God, before Whom my fathers, Abraham and Isaac, walked, God Who sustained me as long as I am alive, until this day, may the angel who redeemed me from all harm bless the youths, and may they be called by my name and the name of my fathers, Abraham and Isaac, and may they multiply abundantly like fish, in the midst of the land." So he blessed them on that day, saying, "With you, Israel will bless, saying, 'May God make you like Ephraim and like Manasseh.' "
And this becomes the traditional Jewish blessing over children: May God make you like Ephraim and like Manasseh. We can recall here the power of language, to bless, and also to curse, and more generally, to heal and to harm. Gather and I will tell you what will happen to you at the end of days. Gather and listen, sons of Jacob, and listen to Israel, your father. Judah, [as for] you, your brothers will acknowledge you. Your hand will be at the nape of your enemies, [and] your father's sons will prostrate themselves to you. A cub [and] a grown lion is Judah. From the prey, my son, you withdrew. He crouched, rested like a lion, and like a lion, who will rouse him? The scepter shall not depart from Judah, nor the student of the law from between his feet, until Shiloh comes, and to him will be a gathering of peoples. Jacob goes on to speak about his other sons, but I want to focus on this passage because, while the twelve tribes are united for the better part of a century under the reign of King David and King Solomon, they then split into two separate kingdoms, the northern kingdom of Israel, and the southern kingdom of Judah, which took its name from the tribe of Judah. When the Assyrians invade and destroy the northern kingdom of Israel, ten of the twelve tribes disappear, leaving only Judah and Levi, the Levites being a priestly tribe with no permanent home. The people of the northern kingdom become known as the ten lost tribes, although some possible remnants of some of them have surfaced in recent years, but in the past some people went searching for ten lost tribes. For example, when the New World was discovered by European explorers, and they first encountered the native Americans, some thought they might be the ten lost tribes. But back in the ancient world, the people who were left behind in the northern kingdom, and others who settled there after the Assyrian invasion, became known as Samaritans. The phrase good Samaritan comes from the New Testament, and the Samaritans are still around today, in very small numbers, practicing a religion similar to Judaism. The southern kingdom of Judah survived for a while longer, until the Babylonian conquest and captivity, but the Babylonians did not destroy the people of Judah, and later, when the Persian Empire conquered Babylon, the Emperor Cyrus allowed the people of Judah to return, and rebuild the Temple in Jerusalem, and this is described in the books of Ezra and Nehemiah. Later still, when the Romans conquered Judah, they referred to the kingdom in Latin as Judea. So, it is from Judah and Judea, or Yehuda in Hebrew, that we get the name Jews, and the word Judaism. Jacob describes his son Judah as a lion, and the lion was the symbol of the tribe of Judah, and of King David, who came from the tribe of Judah, and David's son Solomon. The Ethiopians believed that their royal line was descended from King Solomon and the Queen of Sheba, and used the Lion of Judah as the symbol of their kingdom, appearing on their flag, until 1974, when the last king, Haile Selassie, was deposed, although he is still venerated within the Rastafari movement or religion. Jacob uses the phrase, until Shiloh comes, and the meaning of those words is a bit of mystery. Some interpret the name Shiloh as a variation on the Hebrew word shaluach, which means messenger, and take it as a reference to the Messiah, which of course means different things to Jews and to Christians, while the Moslems interpret it as a reference to the prophet Mohammad. Shiloh is also the name of a city, in the land allotted to the tribe of Ephraim, and that is where the Ark of the Covenant was placed after the Children of Israel return to the promised land following the exodus, which made it the religious capital of Israel before King David conquered Jerusalem and King Solomon built the Temple there. Instead of the phrase until Shiloh comes, the JPS translation of Genesis renders the passage, as long as men come to Shiloh. Shiloh was located in what is now the West Bank, and this brings to mind the fact that there can be conflicts over names, and that some of those conflicts are more than scholarly disputes over the meaning of ancient biblical texts. This includes conflicts between Jews and Arabs over place names in the Middle East. The West Bank, which is now partially under the governance of the Palestinian Authority, has also been referred to as Judea and Samaria by religious and conservative groups opposed to relinquishing control of the territory, as it does correspond to the ancient land of Israel. The coastal region that Israel occupies today was, during the biblical area, the home of the Canaanites, otherwise known as the Philistines. The name Philistine is a variation on Palestine, another name for the land of Canaan that is used over 250 times in the Bible. The various peoples in the Bible referred to as Philistines and Canaanites, like the ten lost tribes, no longer exist. But after the Romans destroyed the second Temple, sacked Jerusalem, and dispersed our people, they merged the provinces of Judea and Galilee and renamed it Syria Palestina. In the 20th century, the British Empire created the Mandate of Palestine after the First World War, and before the creation of the State of Israel, Jewish inhabitants and Zionist settlers were often referred to as Palestinians. Some argue that the Arab inhabitants of this area never called themselves Palestinians until the sixties, but that claim is not universally accepted. There are conflicts over names because words have power. And whoever has the power to name things can exert a certain amount of control over those things, just as Adam did in naming all of the animals. The lesson that we can take from the Torah, and from all of human history, is the importance of using our words, and the necessity of using them with care. Three of the Ten Commandments teach this lesson. The prohibition against graven images can be understood as a commandment to do what parents tell their children to do, to use your words, to communicate with language. The commandment not to take God's name in vain tells us to show respect for the sacred, and the commandment not to bear false witness tells us to show respect for others. And what this requires of us is to be aware, to be mindful of our use of language. It is all to easy to speak without thinking, and what our tradition teaches us is to think, first and foremost, to think before speaking, to be mindful of what we say. Abraham Lincoln said, "better to remain silent and be thought a fool than to speak and remove all doubt." And President Obama asked us to observe a moment of silence tomorrow (Saturday, December 14th) morning at 9:30 AM in memory of the children and teachers who were killed at Sandy Hook Elementary School in Newtown, Connecticut. Silence is the counterpart of words, and without silence, we would be left speechless. Without some degree of silence, language degenerates into noise. I think that the same advice we give children about crossing the street can be applied to our use of words: Stop. Look. And Listen. Listening, above all, requires us to be silent, and attend to what others have to say. To listen shows respect for others' words, and for others as persons, and without listening there can be no understanding. Stop, look, and listen, to each other, and to ourselves, to the still small voice within. Listen to ourselves, and consider the power of our words, think about how others may react to our words, what they might feel when they hear what we might want to say. To be sensitive to the effect that our words have on others. To be ethical in our use of language. And to recognize the value of silence, and to be mindful of the words of our silent prayer: May God keep my tongue from evil and my lips from speaking guile. Amen. And Shabbat shalom.